All Holiday Puppies are Sold! All of our trained puppies are sold. We are thrilled to see Dasher, Dancer, Prancer, Comet, Cupid, Donner, and Blitzen, as well as their brothers and sisters (who were sold before December) go to wonderful homes this holiday. If you’re disappointed to have missed your shot, stay tuned to our newsletter (PUPdate) and our Facebook page as we will have new trained puppies for early Spring. If you’d like to get on the list for Spring, contact Bill at 203.856.2511 or bill@smilingdogpetservices.com. 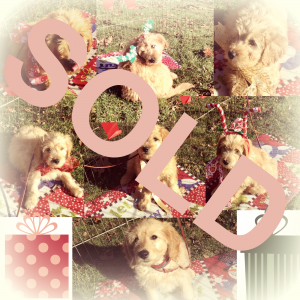 This entry was posted in Articles, Blog Posts, PUPdate Archive and tagged holiday puppies, mini golden doodle puppy, newsletter Dec 2016, puppies, trained dog, trained puppies, trained puppy, trained puppy for sale. Bookmark the permalink.